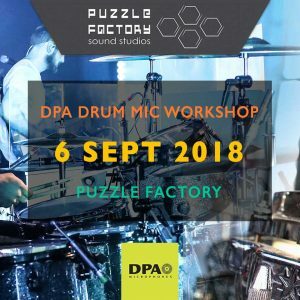 Join us and DPA Microphones for a Drum Mic Techniques Workshop at Puzzle Factory Sound Studio in London on Thursday 6th September. Experience an in depth look into the evolution of microphones for Drums and percussion and hear your rhythm section the way they intended. With artists and audiences increasingly demanding to hear studio quality productions in the live environment we take you though the process of achieving, tight, dynamic drum sounds with DPA microphones. Join us for a masterclass in east Londons newest studio facility Puzzle Factory, as we take you through the various microphone options and placements to deliver an exciting and defined drum sound for your mix. Where: Unit 2, 39 Markfield Road, London, N15 4QA.